Switzerland, 15 November 2011 - The Heterogeneous Technology Alliance (HTA), a team of leading European technology institutes, is developing new methods for packaging and testing microelectromechanical systems (MEMS) devices to meet performance requirements of space missions. As part of the Wafer-Level Encapsulation in Microsystems (WALES) project, HTA members are studying how wafer-level packaging (WLP) can be used to connect and protect MEMS devices in hermetically sealed structures to withstand extreme weather and radiation conditions encountered in space. The project also will provide the European Space Agency (ESA), which is funding the project, a simple and fast standardized test to evaluate the suitability of MEMS for space missions. 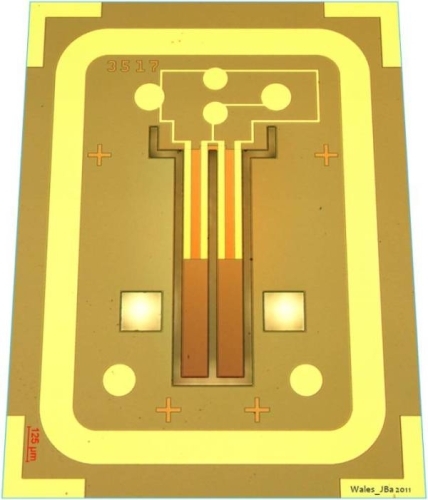 Led by CSEM, the project is developing procedures for sealing and testing MEMS WLP for a piezo-electrically actuated resonator from CSEM and a capacitively actuated resonator from CEA-Leti. Fraunhofer Institute for Electronic Nano Systems ENAS is applying special measuring and testing processes to guarantee the reliability of these MEMS systems. VTT, the Technical Research Centre of Finland, will join the project consortium; negotiations are currently under way. Reliability is a major issue for MEMS in space applications, and establishing new, proven and reliable packaging concepts can dramatically extend the lifetime of MEMS devices and therefore expand their suitability for space missions. Moreover, MEMS in space will benefit Europe's space industry by increasing overall flight-and-exploration reliability through the use of more sensing devices, and reducing costs through smaller payloads. Launched in 2006, the HTA is designed to maintain Europe's leading position in microsystems by combining competencies of each member, facilitating the exchange of ideas between them, and enabling each to contribute to the alliance's joint-development projects with industry partners. The combined technological infrastructure of the members offers business and industrial partners a one-stop shop for complete system solutions for a variety of markets, including automotive, healthcare and wellness, information and communication, home automation, energy, security, consumer, space and industrial process control. "The HTA's participation in the WALES project is an excellent example of Europe's leading research institutes combining their expertise for the benefit of European companies in an industry where we must maintain our leading position", said Jussi Tuovinen, vice president at VTT and HTA Chairman for 2011. "The synergies and cooperation of the partners assure that the impact of this project will reach far beyond MEMS packaging."